The village of Chulucanas in northern Peru produces its own brand of crafts, chulucanas art. The distinctive product or artifact are the charmingly rotund clay figures with their soft and satiny finish resulting from a firing process that uses smoldering mango leaves. The ancestor and model of these ample and portly figures is the gourd-like fruit of the calabash tree. 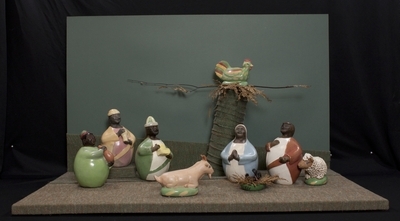 Calabash shells, once used to represent human figures thanks to a carved little head added to the gourd, mutated over time to become the colorful and much sought-after clay sculptures like the ones in this nativity set. The prominently-featured rooster is a typical presence in Latin American nativity sets. It is a symbol of treason and reconciliation (Saint Peter) and, more generally, a harbinger of fertility. Ceramic figurines depicting the nativity of Jesus, created in Chulucanas, Peru by Angelica Silva. The exact date of creation is unknown. Exhibition label originally written by Fr. Johann G. Roten, S.M. for exhibit held at Roesch Library, University of Dayton.